The Riverdale teen finds his life turned upside down after locking lips with his boyfriend, Devon, in Pop Tate's diner, drawing the ire of at least one disapproving Riverdale mom. This comic book image released by Archie Comics shows issue 10 of "Kevin Keller" featuring openly-gay character Kevin Keller, right, kissing his boyfriend Devon. The issue will go on sale on Aug. 7. It's just a quick kiss, but it's a long step forward for Archie Comics' only openly gay character Kevin Keller. The woman "gets very offended and kind of pitches a bit of a fit," said Dan Parent, who writes and draws the issue, "Kevin Keller" No. 10 that is released Aug. 7. "Kevin is kind of used to that, but Veronica records the whole thing and of course uploads it to the Riverdale equivalent of YouTube and that starts a bit of a debate," said Parent. 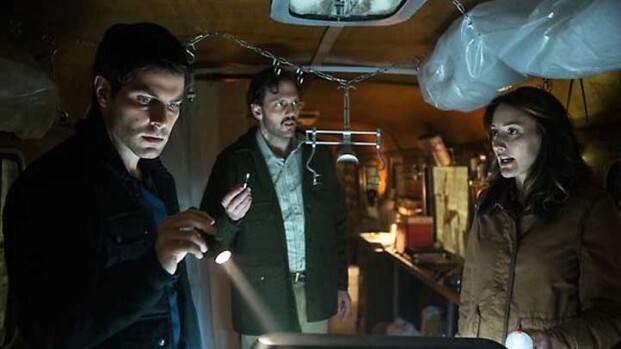 Silas Weir Mitchell, David Giuntoli, and Bree Turner reveal cast members death on this seasons last episode of Grimm. The finale will air on NBC, May 21. For Archie Comics it's a bit of art imitating life. Parent said he wrote the story after efforts to remove a comic magazine showing Keller getting married drew at complaints. One Million Moms, a project of The American Family Association, asked Toys R Us not to display "Life With Archie" No. 16 near its checkout aisles. Toys R Us did not, and the issue went on to sell out its print run. Parent called the new story a "playful poke" at the protest. Keller debuted in "Veronica" No. 202 in September 2010. It resulted in Archie Comics' first-ever second printing. It was quickly followed by a four-issue miniseries and the current monthly title. Publisher and co-CEO Jon Goldwater said the fact that any kiss is being shown in the pages of an Archie Comics book is a step in and of itself. "There aren't that many on-panel kisses in the pages of Archie, but you often see the lipstick on Archie's face afterward," he said. Goldwater said Keller's character has let the company weave in contemporary issues to its imaginary world. "We certainly pride ourselves on being contemporary, but that's not the reason why we're showing 'The Kiss.' Just like when Kevin first told Jughead he was gay, it was in the natural course of conversation," said Goldwater. "We are creating this in the same way. It's just part of the story."